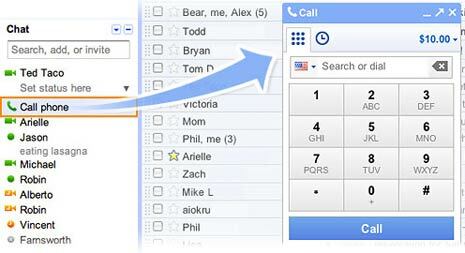 You can easily make quick phone call by clicking ‘call phone’ button in chat window on left side of Gmail inbox. To receive phone calls in Gmail, you need to make sure of few things. Besides the basic requirements of ‘video – voice plugin’ [gmail.com/call], mic, headphones, gmail account – you would need following configurations. You need a full Google Voice account in order to receive phone calls in Gmail. You can perform this upgradation for free that provide access to additional Google Voice features such as one number that rings all your phones and voicemail transcription. 1. Click ‘Call Phone’ link in chat list on left side by logging into Gmail account. 2. In the call window, click the current account balance and select History or Add credit. 3. When in Google Voice, click Upgrade your account button. 4. Follow on-screen instructions to complete upgrade process. Also pick your new Google number to be used for receiving phone calls in Gmail. As of now, US users can perform above upgradation as it requires a valid US number. 1. Make sure you make atleast one outbound call from Gmail account. 2. In Google Voice, goto Voice settings under the Settings link. In Phones tab, click the check box next to Google Chat. Once you have above setup, click ‘answer’ button to receive an incoming phone call in Gmail. You may click ‘ingore’ button if you do not wish to attend specific phone call.